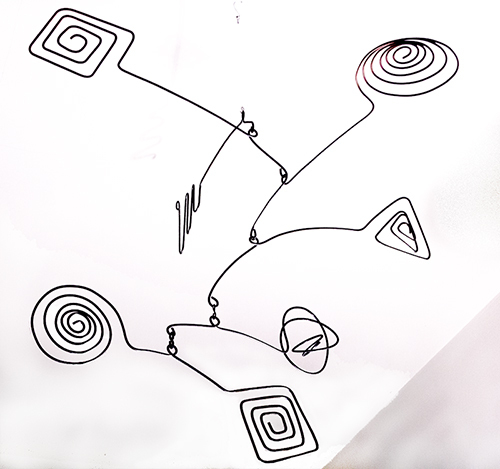 This wire mobile is a bit more “designed” from the beginning in the sense that I was going for a specific look. In most other cases, I have a vaguer sense of what I want, but let things play out as the piece develops. “Angular and Round” is the provisional title. It is very difficult to name these things. 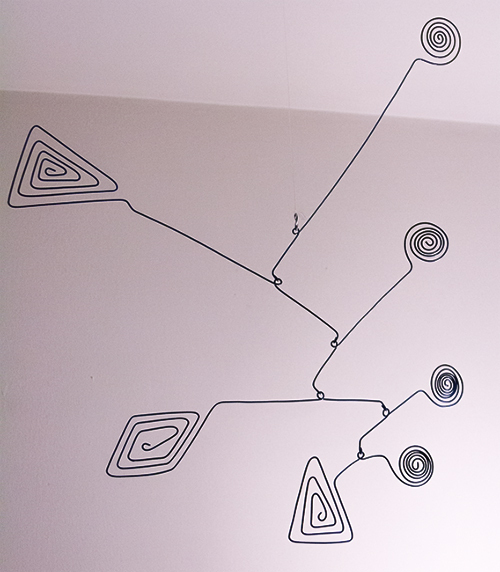 Here’s another example of an all-wire mobile, which has been a style/material I’ve been experimenting with in the past couple of weeks. I really like spirals, arcs, squiggles, and geometric shapes, so I find this appealing. The wire is galvanized steel, 14 gauge, lightly spray painted with black paint and a touch of orange in a couple of places for highlights. It’s about 18 inches high, wide, and deep. Schmitt Design is the mobile and furnishing company of Brian Schmitt. Brian started his company making mobiles primarily, but has since branched out into other products related to home furnishing, including lamps and furniture. His mobiles, which are beautifully crafted out of bamboo, are designed to move gracefully through the air with the individual pieces moving entirely independently (or almost) of each other. This is something that is different from many mobile designs which tend to sculpt a basic shape in space within which there is some freedom of movement. 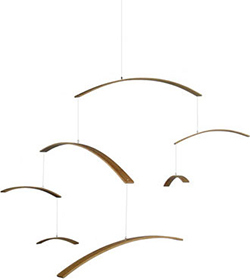 But, as I see it, in Brian’s bamboo mobiles, the overall shape is less defined, but you get a nearly infinite set of relationships among the individual pieces as each is free to rotate 360 degrees in space while the piece above, below or across from it is also moving through 360 degrees. 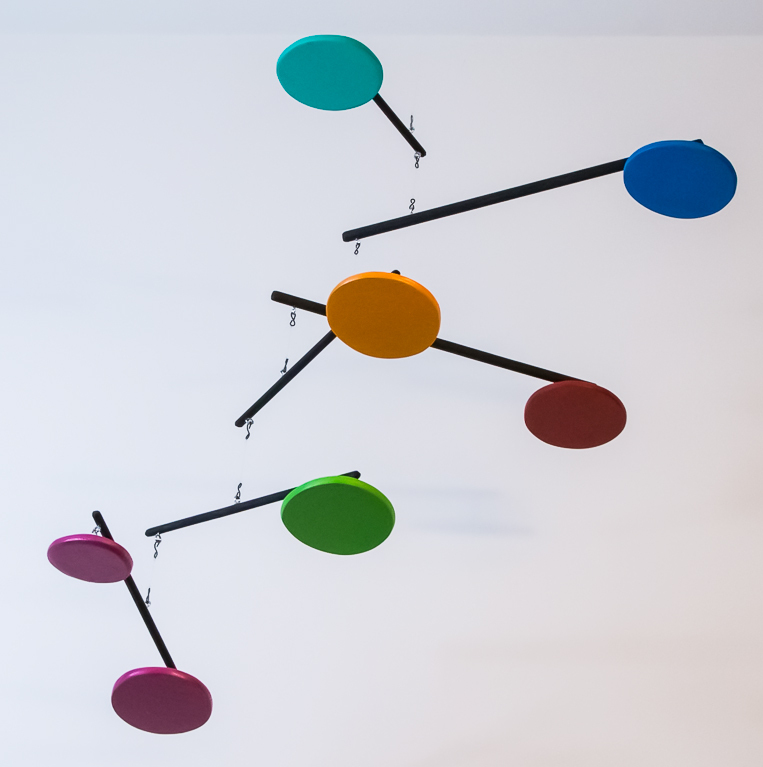 One could view these mobiles from underneath and, assuming there was some air movement in the room, see an endless variety of constantly changing patterns. This character, or perhaps we can call it behavior, is what attracted me to making mobiles in the first place. 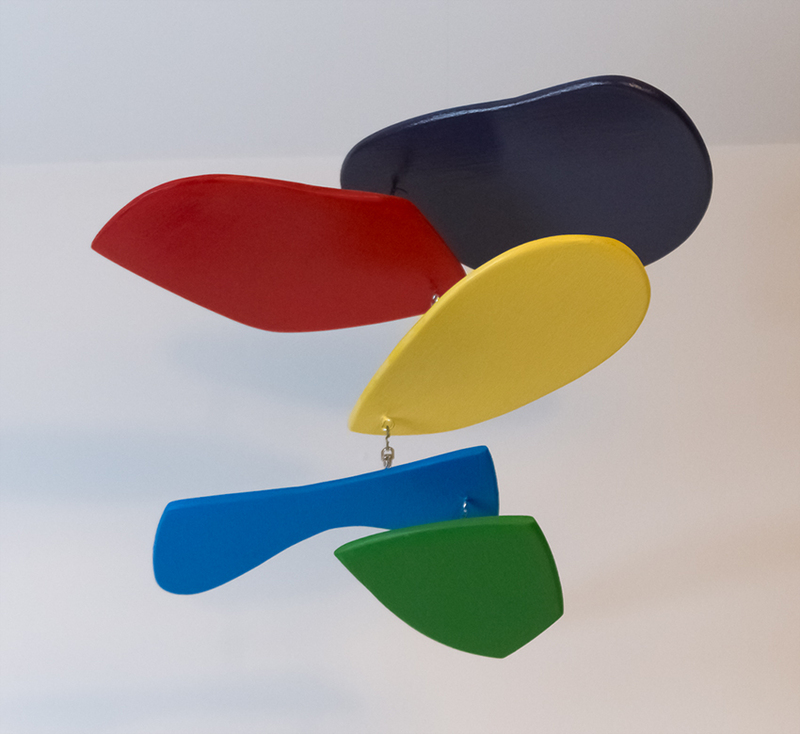 Though I love Alexander Calder and find his work inspirational, most of his mobile creations are built so that the individual pieces flexibly move together, not independently of each other. Here, on the left, for example is a simple mobile I did a few days ago to test some ideas. Each of the pieces can rotate mostly independent from the other pieces, although in this case, since they are all joined by the same nylon line, the movements affect each other; another effect I find engaging. behind the scenes with Brian Schmitt from Brian Schmitt on Vimeo. As part of this blog, I am going to start doing short profiles of other mobiles artists. 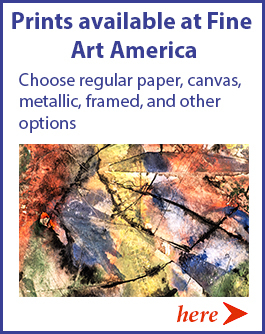 (I believe that is the approprate term as “mobile artists” implies something very different). 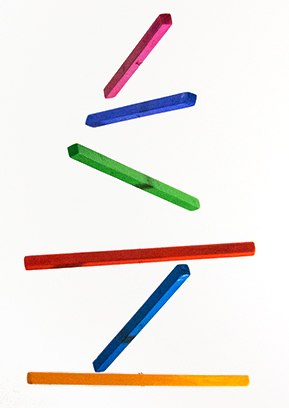 I just discovered Ivan Barnett, who does some incredible abstract mobiles. They look like a mix of Calder and African or other traditional art. Very vibrant, contrasting colors and neat angular shapes. Here’s an online gallery worth checking out. I’d love to see these in a gallery someplace, especially since they are 4 to 5 feet high and would make quite an impression. And, of course, when it comes to mobiles, seeing the third dimension is crucial. For more background, see this page on Ivan. In upcoming posts, I’ll be showing a variety of the mobiles I’ve created in the past several months as well as those I make going forward. This one is unique in the sense that I haven’t done any others like it. I like working with irregular, smooth, wood shapes as seen here along with bright colors. I need to find better swivels, however, so each of the pieces will rotate independently. That is how I envisioned it. One bit challenge with using irregular pieces like this is to balance each wood piece perfectly so that it is exactly horizontal. The other day, I posted a video by Mark Leary on how to make a mobile. Mark’s video was quick, something you can think of as a video time lapse presentation. No instruction, but the visual was quite good and you could learn a lot. Here’s another video; which is much more like a tutorial with instructions. Laurent Davidson is the artist/instructor and he does a great job building a simple mobile from scratch using very basic materials. 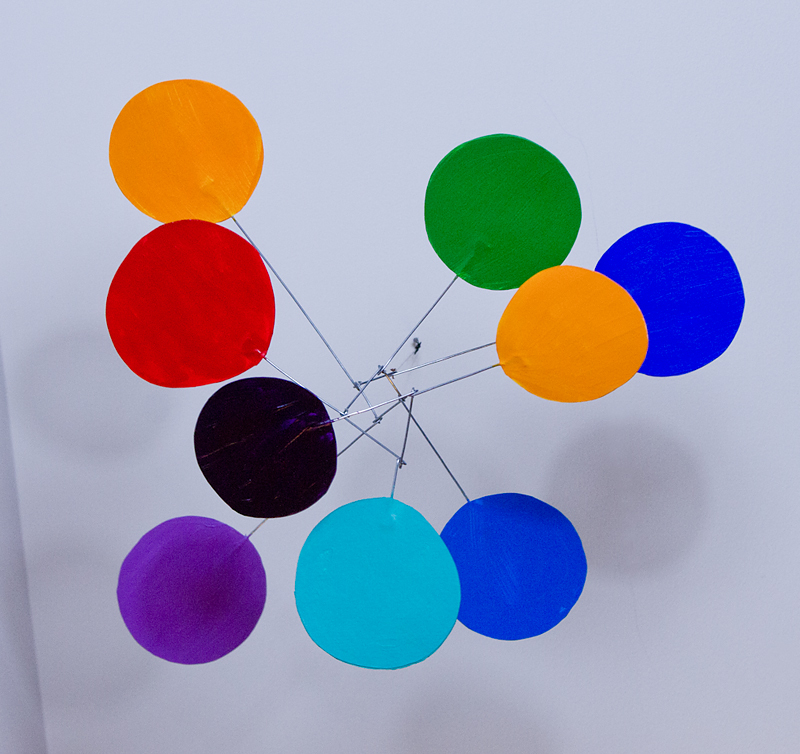 If you want to learn some basic principles behind creating mobiles, this is a great video. It’s also good for more experienced creators. I picked up several helpful hints. Laurent is currently based in Carmel, California. Take a look at his website to see a lot of his neat, colorful work. I may show some individual works of his in a future post. 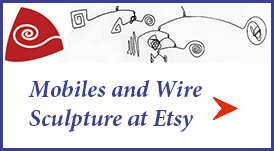 Many of my earlier mobiles were made with card stock wrapped around the wires and glued, painted with acrylics, and then assembled. This is one of those. These disks are between 3 and 4 inches in diameter. Dimensions for the entire mobile are about 10 inches high and 15 inches across. It is very light, so reacts easily to slight air movements. I’ve been doing a lot of work on my mobiles lately. I’ll be posting here more often and will also create a site on Etsy for anyone who wants to get one. I’ve also been looking around to see what others have been doing and have come across some really great work, which I will be sharing. Here’s a quick tutorial by Mark Leary on how to create a simple mobile.